It is always a challenge to create tasty baked snacks for folks with specific food allergies but It certainly can be accomplished. These delicious cookies were created for kids that had both egg and nut allergies and although it took a little tweaking to get them just right, the final version turned out really well and the kids loved them. I added chocolate chips to one batch, and then raisins to another and both options turned out great and were enjoyed by the entire family. 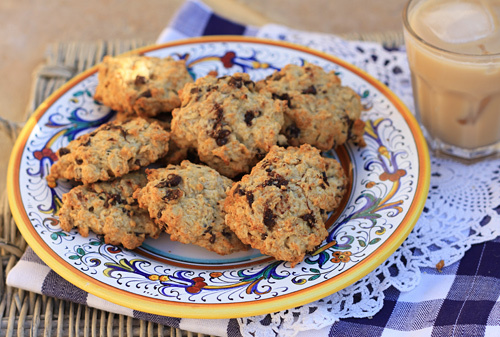 These oatmeal cookies are chewy rather than crisp and will stay fresh for 5 to 7 days if stored in an airtight container. These cookies are both nut free and egg free for those with allergies. If dairy allergies are an issue you can easily substitute dairy-free shortening for the butter listed. These cookies are both egg and nut free yet are a delicious, healthy snack for kids with allergies. In a bowl, combine the butter, sugar, and applesauce with an electric mixer until smooth. In a separate bowl, mix the flour, cinnamon, baking soda, and salt. Add the flour mixture to the moist ingredients and mix just until combined. Stir in the oats and raisins or chocolate chips with a wooden spoon. Line two baking sheets with parchment paper or silicon sheets and drop the cookies using a tablespoon onto the sheets, allowing space between each. Cool to room temperature and then store in an airtight container.